Edward Snowden is pictured during an interview with the Swedish daily newspaper Dagens Nyheter in Moscow in October 2015. Russia says that Edward Snowden, the former U.S. intelligence contractor who leaked thousands of secret documents from the National Security Agency (NSA), has been granted permission to remain in the country for at least two more years. The move comes as outgoing U.S. President Barack Obama commuted the 35-year prison sentence of Chelsea Manning, another American who revealed classified information through WikiLeaks. Russian Foreign Ministry spokeswoman Maria Zakharova revealed on Facebook late on January 17 that Russia has extended Snowden's residence permit. She made the statement in a comment on a recent published call by former acting CIA chief Michael Morrell for Russian President Vladimir Putin to hand Snowden over to the United States. "The funniest thing is that [Morrell] doesn't know that Snowden's Russian residency permit has just been extended by a couple years," Zakharova said on her Facebook page. Snowden’s Russian lawyer, Anatoly Kucherena, was later quoted as saying that his client has been given the right to remain in Russia for another three years, until 2020. Kucherena also said Snowden would be eligible to apply for Russian citizenship once he has been a resident for five years, according to Russian state news agencies. Snowden fled the United States in 2013, traveling to Hong Kong and then to Russia, where he was stranded at a Moscow airport after the United States revoked his passport and was later granted temporary asylum. He is wanted in the United States on espionage charges and could be imprisoned for 30 years if he returns to the United States and is tried and convicted. Snowden had leaked 1.5 million documents he acquired while working as a contractor for the NSA, prompting a furious public debate about the legality of some of the agency’s programs, about privacy concerns, and about U.S. snooping on its allies. In one of his final acts as U.S. president, Obama granted commutation of sentences to 209 individuals and pardons to 64 others. The list includes Manning, who is serving 35 years in prison on espionage charges and other offenses for her role in leaking diplomatic cables to WikiLeaks in one of the largest breaches of classified material in U.S. history -- but not Snowden. White House spokesman Josh Earnest said last week there were "some important differences" between Manning's case for mercy and Snowden's. "Chelsea Manning is somebody who went through the military criminal justice process, was exposed to due process, was found guilty, was sentenced for her crimes, and she acknowledged wrongdoing," Earnest said. "Mr. Snowden fled into the arms of an adversary and has sought refuge in a country that most recently made a concerted effort to undermine confidence in our democracy." At a court hearing, Manning apologized for "hurting the U.S." and said she had mistakenly thought she could "change the world for the better." 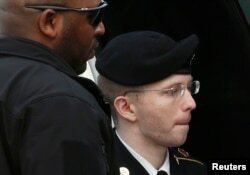 The 29-year-old transgender U.S. Army private, born Bradley Manning, is now scheduled to be freed on May 17 of this year, instead of in 2045. Manning twice attempted suicide last year at the male military prison where she is being held in Kansas. She also went on a hunger strike, which ended after the military agreed to provide her with gender dysphoria treatment. Also on January 17, WikiLeaks founder Julian Assange appeared to waffle on his pledge to accept U.S. extradition now that Obama has pardoned Manning. Melinda Taylor, who serves on Assange's legal team, initially told the Associated Press he would stick to his offer last week to accept extradition if the White House granted clemency to Manning. But Taylor later said Assange would like the U.S. Justice Department instead to announce it will not pursue charges against him and that it is closing its investigation of WikiLeaks and ending its "war on whistle-blowers." Assange has been living at the Ecuadorean Embassy in London since 2012 to avoid extradition to Sweden on sexual assault charges. He says he has long feared if he leaves the embassy he could be extradited to the United States to face criminal charges, although no formal charges have been filed against him. WikiLeaks and Assange have been under investigation for years for publishing thousands of highly sensitive leaked documents from the United States. In particular, WikiLeaks is under FBI investigation for its central role last year in an alleged Russian scheme to influence the U.S presidential election through the hacking and publishing of internal Democratic e-mails. The White House, in shaving more than 30 years off Manning's prison sentence, said the commutation was not influenced in any way by Assange's extradition offer. Assange did not immediately comment on whether he plans to surrender, but he did tweet: "Thank you to everyone who campaigned for Chelsea Manning's clemency. Your courage & determination made the impossible possible." In the United States, a commutation means the sentence is lifted, while a pardon also removes other penalties such as the bar on convicted felons to sit on federal juries and state-level prohibitions on such things as voting. Neither clemency measure is an acknowledgment of innocence.